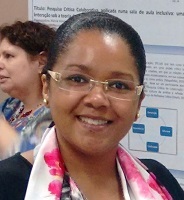 Ever since my graduation I have been keen on L. S. Vygotsky’s ideas and right now I am a PhD student at the Programme of Education and Health in Infancy and Adolescence at the Federal University of São Paulo (UNIFESP) under the supervision of Prof. Sueli Salles Fidalgo. I believe that by participating in this Summer School I will have the chance to deepen my knowledge in L. S. Vygotsky’s theory, which I have been studying for a while, having completed two courses about the aforementioned author’s work. I am confident that at the Summer University I will be able to improve my investigational abilities concerning the Cultural-historical approach, taking as a yardstick the studies on Defectology, in order to better comprehend the author’s yearning desire to grasp how the higher mental functions unfold in children with special needs. With this input, I will certainly be able to refine my research. Besides that, my great desire to take part in this Summer School has to do with the fact that the theoretical and methodological foundations will emphatically contribute to my academic life as a student and teacher educator, since I truly identify with this approach.